Investigate who wants Lady Syl, the Duchess of Dementia, assassinated. Travel to the House of Dementia and meet Syl, the Duchess of Dementia. Syl is a very paranoid woman and is convinced that someone is out to get her. She appoints you to the position of "Grand Inquisitor" and tasks you with uncovering these conspirators. She also grants you the assistance of her torturer Herdir for the duration of the quest. Herdir is a capable Imperial who can be found in the House of Dementia's Torture Chamber. He is quite efficient at "persuading" people to talk using his favorite tool, a bolt of lightning. The countess then leaves you to your investigation with one final warning: "If no one is found, you will be held responsible." You can start the "investigation" with Syl's steward Kithlan, who is conveniently located in the House of Dementia's main chamber, or with Ushnar gro-Shadborgob in Crucible. After torturing or persuading either of those two, you can learn that Anya Herrick, another of Syl's assistants, has been looking even more afraid than usual, and that she may know something. After some brief coercion from Herdir, Anya will reveal that Ma'zaddha is involved in a plot against Syl. Questioning him at this point, however, will reveal nothing, as he boasts that you don't have enough evidence against him. A quest update suggests you question Crucible's townsfolk about the conspiracy. As Haskill says, "Paranoia is the order of the day in Crucible. Many keep their eyes open constantly, and some of those eyes may have seen something useful". Certain citizens, such as Caldana Monrius, Bhisha, Cutter or Sickly Bernice, will reveal, with some "persuasion" from Herdir of course, that Ma'zaddha has been meeting surreptitiously with Nelrene, one of Syl's Dark Seducer guards. The two conspirators will meet after midnight, near the sewer gate by Brithaur's House. Ask Herdir to wait out of sight, and sneak close enough to eavesdrop on their conversation. If you have difficulty eavesdropping, a good hiding place is located behind the crates underneath a nearby set of stairs. The way to get the best view and listen to the conversation is to use an invisibility spell and stand right next to the two. Once the discussion has ended and Nelrene has departed, confront Ma'zaddha and he will reveal that he is indeed involved in a plot to kill Lady Syl and requests that you meet him at his house in a day's time for more information. If you choose to confront Nelrene immediately after you confront Ma'zaddha she will deny that she is involved and say you have no evidence. The quest log then suggests you need proof or to be more persuasive with Nelrene. If you go and get Herdir to follow you again you can have him torture Nelrene three times and she will admit she is guilty and implicate the ring leader of the Conspiracy Muurine. 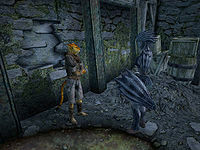 Your other option instead of confronting Nelrene after overhearing the conversation is that you can simply choose to wait for a day and enter Ma'zaddha's house. After one day has passed, enter Ma'zaddha's house for your scheduled rendezvous. 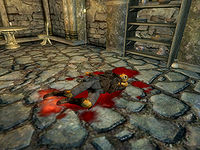 Unfortunately, as soon as you enter, you find Ma'zaddha lying in a pool of his own blood. Search the corpse to find his key, which opens a cabinet in his room, located upstairs. Inside you will find Ma'zaddha's Crinkled Note and Nelrene's Ceremonial Shortsword. Retrieve both and speak to Nelrene. Confronted with the evidence, she reveals that Muurine was the mastermind behind the plot. Locate the would-be assassin and interrogate her to hear a confession. Once you report your findings to Syl, she requests that you meet her in the Torture Chamber. Once you are present, you'll notice that Muurine has been imprisoned in the central cage, awaiting her fate. After passing judgment, the Duchess executes Muurine herself, activating a lethal electric trap and crushing Muurine's conspiracy for good. Pleased with your efforts, Syl then rewards you with the unique bow Ruin's Edge and the rather meaningless title of "Courtier of Dementia". In order to be able to interrogate someone, Herdir must be in the same cell; otherwise, the "Conspiracy" topic will not be available. Herdir's disposition towards you will be lowered every time you choose "What's my current task?" or "Who should we be looking for now?" if it is greater than 40. 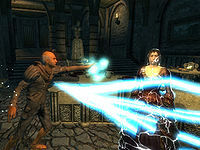 Upon successfully completing the quest, a trophy version of the Inquistor's cage will appear on a platform in Sheogorath's Palace. A Dark Seducer named Brevi seems to have been the original choice for Herdir's role, but she does not appear in the final game. As Herdir is not meant to follow you outside Crucible, leaving the Isles will cause him to disappear completely from the game. The best option is to reload a save in which the quest has not yet been started. Alternatively, waiting for one or two days in Crucible or summoning Haskill and asking him about the Conspiracy may also fix the problem. Occasionally, Ma'zaddha and Nelrene will meet but will not exchange dialogue with one another. The exact cause of this glitch is unknown. Wait for a couple of hours and talk with the two conspirators. It will end their meeting, and you will need to wait until the next day to try again. Stopping and following just one conspirator about one hour before the meeting may avoid the aforementioned glitch. Leaving the area and re-entering. Should this still fail, restart the game or reload a previous save. Remove any NPCs in close proximity to the pair. It is possible that a nearby NPC may prevent Ma'zaddha and Nelrene from talking, just as they will not talk if you are nearby. You may try selecting Nelrene in the console, then typing the code set SE05Conv to 1. This is normally done by her script when she's nearby Ma'zaddha to makes them initiate the conversation. If the variable isn't set to 0 or 1, then the Ma'zaddha proximity check doesn't happen and this can be one cause for the glitch. Finally, you can use the console command setstage SE05 70 to advance the quest. It is possible that Ma'zaddha and Nelrene will not meet and will not have the conversation either. Nelrene will come to the meeting point, but Ma'zaddha will not turn up. The reason for this bug is unknown. ? It is possible to solve the problem using the console command setstage SE05 70. Sometimes, after exposing the traitor to the Duchess, she will proceed to the torture chamber normally, but her speech will not start. Attempting to speak with her will result in a message saying you will speak once in the chamber, despite her already being present there. Select Syl in the console and type set Speech to 1. This should force her execution speech and proceed with the quest normally. Muurine may not be killed when in the cage. ? Sneak attack her before talking to the Duchess in order to lower her health before entering the cage. Torturing Nelrene three times before confronting her with the evidence will break this method of completing the quest, as Herdir will state that this person has nothing more to say even if you have acquired the evidence. ? 10 I need to travel to the House of Dementia, and seek an audience with Syl. 15 Kithlan has told me that Lady Syl is especially reclusive lately. I may be able to catch her in the garden late around midnight. 20 I have been tasked with finding the people conspiring against Lady Syl. I need to find and speak to Herdir. He can always be found at the torture chamber in the House of Dementia. 30 Herdir has agreed to accompany me. I need to speak with people in Crucible for information about this supposed conspiracy. Perhaps starting with those close to Syl would be useful. 40 I have been told that Anya Herrick may know something about a conspiracy. I should find and interrogate her. 45 Anya Herrick refuses to speak with me. I need Herdir with me to help convince her to talk. 50 Anya Herrick has named Ma'zaddha as being involved in some sort of plot against Lady Syl. I should find and speak to him. 55 Ma'zaddha refuses to give me any information. I need evidence that he's involved; I should speak to the citizens of Crucible to learn more. 60 I've been told that Ma'zaddha has been meeting Nelrene late at night in Crucible. I'll need to find them and listen in on their conversation. 65 I was discovered while attempting to overhear Mazaddha's conversation with Nelrene. I will have to try again another night, and be more careful to remain undetected. 70 I've overheard Ma'zaddha and Nelrene speaking. I need to confront Ma'zaddha with this information. 80 Ma'zaddha admitted to being involved in a plot to kill Lady Syl. He's asked for time to learn more about who's behind it. I should meet him at his house in one day's time. In the meantime, I should investigate Nelrene's role in this. 90 Nelrene has denied involvement in any sort of conspiracy. I'll need to be more persuasive with her, or find direct evidence she's involved. 92 I've found Ma'zaddha dead in his home. I should see if he was holding any evidence of this conspiracy. 95 I found a key on Ma'zaddha's body; he has hidden evidence somewhere that may help my investigation. I'll need to find it. I have found the items Ma'zaddha hid in his house. The evidence points to Nelrene, and I should confront her about it. Nelrene admits to being involved in a conspiracy, and has named Muurine as the architect of the plot. I'll need more evidence before confronting Muurine. 120 I have confronted Muurine, who has confessed to trying to kill Lady Syl. I should report this news to Lady Syl at once. 130 Lady Syl has asked me to meet her in the torture chamber. I should travel there immediately. 200 Finishes quest The conspiracy has been stamped out. Lady Syl has executed Muurine, and thanked me for my help. It is possible to use the console to advance through the quest by entering setstage SE05 stage, where stage is the number of the stage you wish to complete. It is not possible to un-complete (i.e. go back) quest stages. See SetStage for more information.